At the Open Government Data Camp in Warsaw on 20 and 21 October I hosted a workshop on ‘making open government data work for local government’. If open government data is here to stay then only because it has become an instrument to government bodies themselves, and not because government are releasing data only because of compliance with transparency and re-use demands from others (central government or citizens). This workshop started from the premise that there is opportunity in local governments treating open data as a policy instrument to find new solutions to the issues local communities face, amongst others in coming up with new ways of working in light of budget cuts. Contributions were made by the local open government data initiatives of the cities of Berlin, Munich (Germany), Amsterdam, Rotterdam, Enschede (Netherlands), Linz and Vienna (Austria), who all shortly presented the current status of their initiatives. It was great to be able to have seven cities take the stage after each other to explain their work in and with local government on open data, and it shows how much things have changed in the past year alone. Slides of the introductory presentation I gave are available, and are embedded below. How to make the case for local open data? After the introductions, the workshop participants worked in little groups on identifying local issues where open government data could be used towards new approaches by local government and citizens. Identify issues that are currently relevant to your local community. Try to define which datasets might be connected to these issues. Discuss what new steps are possible, using the datasets mentioned. The collective output of the workshop has been made available as a document I wrote for the ePSIplatform.eu (download PDF), and is embedded below. It took over two years, but this week a FabLab opened right in my own home town, to both my and Elmine’s considerable joy. 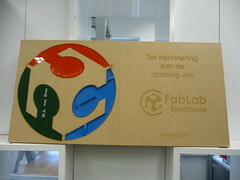 FabLab Enschede has been a long time in the making, with the lead of the project changing hands several times (also between different institutions), but with the consistent and persistent support of civil servant(s) of the city, guiding the project through the various administrative hoops to secure funding. I wasn’t involved directly but on behalf of the FabLab Foundation added our experience with starting other labs, and helped the plan evolve. In the end, the FabLab has ended up under the umbrella of Saxion Hogescholen (the local university for applied sciences), and has a focus on smart materials and textiles. It is housed directly adjacent to Saxion’s materials lab and product testing lab. The formal opening was a great and festive event, with a lot of interest from the business community, and also a lot of people showed up who were eager to start making things. That however is not quite possible yet. Machines are still to be delivered (for the opening they borrowed some machines from elsewhere), and there is also still a job opening for the FabLab’s coordinator. So I am curious to see when it really opens, and how quickly it will gain traction in the local community here. 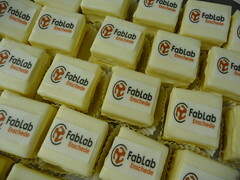 For now I am just extremely pleased that I as a board member of the FabLab Foundation BeNeLux could sign the license for FabLab Enschede, and that there is now a FabLab in my own city. 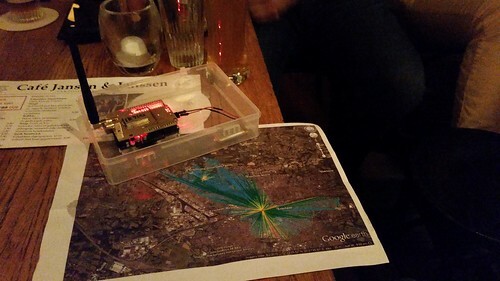 Last Saturday, December 4th, the international Open Data Day took place in conjunction with Random Hacks of Kindness. 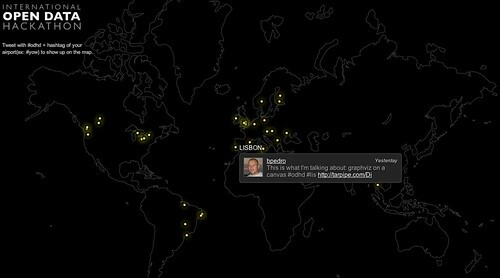 In 73 cities around the globe groups of people came together to work on open data. 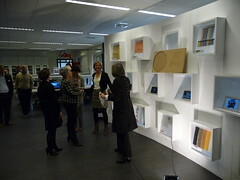 In the Netherlands activities took place in Amsterdam and my home town Enschede. 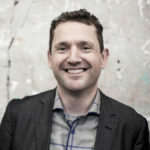 In the last days of October David Eaves (open data advocate from Vancouver) first gave voice to the idea of doing local open data events around the world on a single day. Others quickly picked this up. Mid November the Open Government Data Camp in London, hosted by the Open Knowledge Foundation, brought together people from 30 countries, and that was a good opportunity to increase momentum for the international open data hackathon, as we all got to meet face to face. A little over two weeks ago a few civil servants from Enschede, a student and me met up to discuss if we could take part. We had originally met during the Open Innovation Festival in Enschede in June this year, and were looking for a way to take the next step for open data in our city. Previously we boldly had announced a local open data event, but then over the summer organizing it stalled. 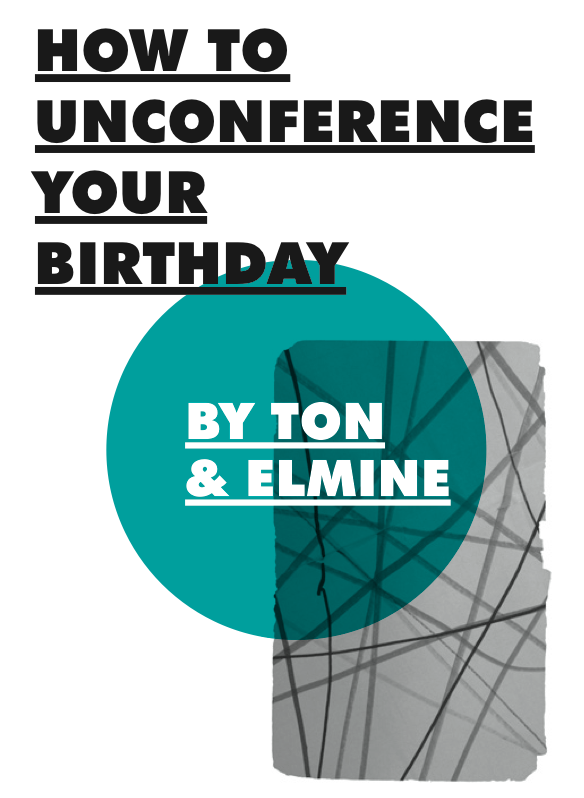 We agreed that this international open data day might be the trigger we needed to actually do it. Over lunch we settled on a location: the one we were having lunch at, a meeting lounge in the city center with wifi. 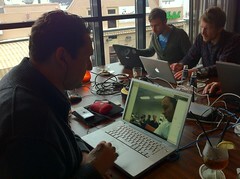 That afternoon we also brought a website, Open Data Enschede, online announcing our plans. Two of the civil servants involved, Patrick Reijnders and Peter Breukers started asking their colleagues inside city hall for data sets that could be released. A few days before the event we knew that the work of Patrick and Peter paid off, and that we would have about 25 data sets to work with. The data covered amongst others neighborhood statistics, street names, house numbers, but also the sewage system, geographic height lines, and the location of bus stops and bus routes. We didn’t know how many people would be coming though. As it turned out we had 9 people there for the entire day, entrepreneurs, students, civil servants and an IT-savvy member of the city council, all with coding skills. We were joined for part of the day by about another 10 people. Some of them civil servants involved with information management and geo-information in the city, others from the ITC (international cartography university), as well as the head of the statistics department from the neighboring city Hengelo. This meant lively conversations throughout the day, along with real work being done with the data. 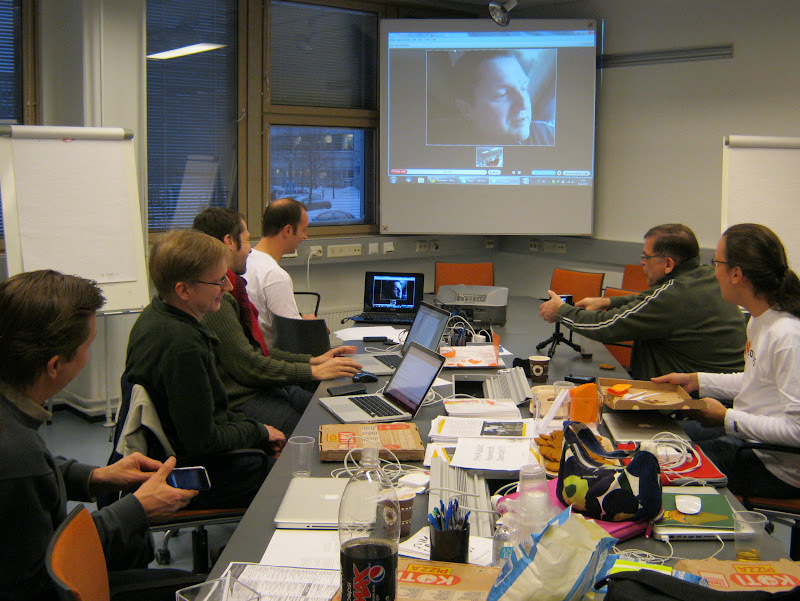 We ended the day with video sessions with the Open Data Day groups in Helsinki (video) and Vienna, talking about the outcomes. 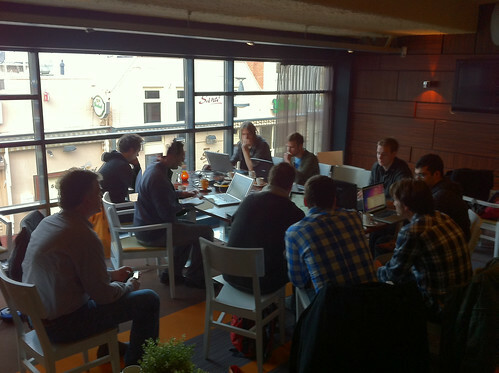 For Enschede the Open Data Day was a great success for two main reasons. First of all it meant that a first wave of data sets now has become available. Second, and more important, we have brought together almost 20 people interested in open data, who weren’t aware of each other before (see photos). 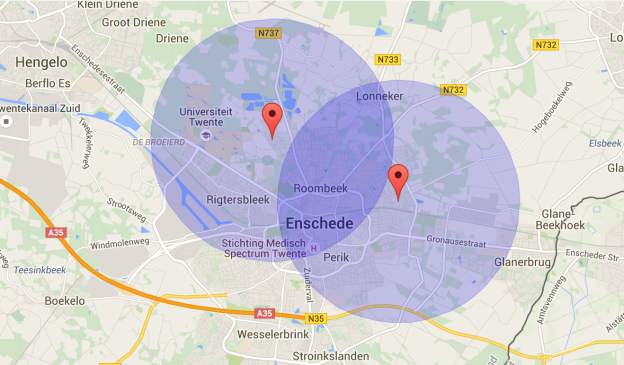 This is a significant step in creating more momentum in Enschede. A next, more informal, meeting will take place in January 2011 to explore what ideas exist for open data in Enschede, and how to make them reality. The Dutch Data Drinks that Alper started to bring together open data enthusiasts in the Netherlands will get a local chapter, Enschede Data Drinks. But, of course, like in other participating cities, we also built a few things on Saturday, both currently not more than alpha / demo material though. One is a map of all building permits in the city, with the possibility of accessing the underlying drawings of the building plans, which reuses the building permits data as it is available on the Enschede municipal website. This was build by Robin Janse and Maarten Brouwers, of the Bean Machine. The other demo maps out companies that went bankrupt for any given post code in the Netherlands, by getting the data from the API of openkvk.nl which in turn re-uses the Dutch trade register. This demo was build by Roy van der Veen. I certainly came away from the day with a lot of energy, and am optimistic about moving open data forward in our city. To help stimulate that I offered the city 11 days of my time in 2011, to work with them on open data and figuring out ways how open data can be of benefit to local government as well. In exchange I don’t want money, but the release of data sets to the public. Let’s see if the city takes me up on my offer!